Journey back through childhood classics like Peter Pan, Alice's Adventures in Wonderland, and more in this adorable picture book about the joys of reading! There is nothing like a book to take you to places you’ve never been. Best friends Foxy and Piggy can’t wait to tell each other about all of their adventures in reading! Flying over Neverland, swimming with a mermaid, joining in a mad tea party, soaring on a magic carpet—old classics come to life in the eyes of two little readers who can’t believe what they’ve seen. Journey back to old favorites and experience the magic all over again in this adorable picture book about the joys of reading! 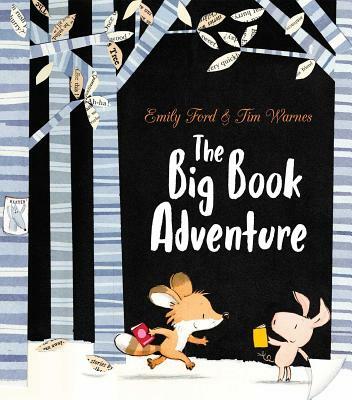 Emily Ford has only ever worked in the world of children's books, apart from a very early foray into shoe fitting and face painting (she does a great tiger). She'll write on anything she can find—from notebooks to used envelopes and the backs of old receipts. As a child her handwriting was neat but now it's almost illegible—only she can read it. Emily lives and works in London. Award winning children's author and illustrator Tim Warnes' first book was published in 1995. Since then, he's worked on more than sixty-five books, which have been translated into eighteen different languages. He also has an online comic strip, Chalk & Cheese, published every Monday and Friday. Tim is married to fellow illustrator, Jane Chapman. They have two boys and work from home in the countryside in southwest England. When he's not illustrating new books, Tim enjoys birdwatching, making films, reading comic strips, and wearing fancy hats!